Evening visit until midnight close. Amazingly packed until this bewitching hour. Sambrook's - Watneys Young Harvey 4.00 Not Tried Where is the true brewing provenance at point of sale? 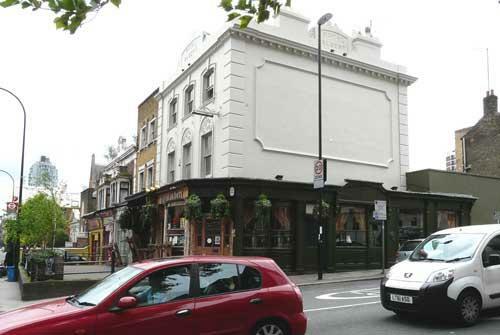 The pub is found in New Cross, Greater London, SE14 6TJ. Located in New Cross Road it could be in Deptford or New Cross. Almost universally described as the “best pub in the area” the Royal Albert has massively improved since its 2007 reversion to its proper name, after a time as the Paradise Bar, and reversion to proper pub values. Has a pubby space at the front and more of a dining room feel towards the rear, where there is an open view kitchen. Very handy for Deptford Bridge DLR or New Cross stations. Sports 8 handpumps, one of which regularly carries a cider. We have visited this pub 201 times, seen 475 different beers and tried 249 of them.